Further improving search is a priority for all of us at LinkedIn. That’s because our member base is rapidly expanding (we have more than 347 million members and more than two new members join every second) and recruiters like you do a lot of searching on LinkedIn. In fact, on average more than 8 million searches are conducted across Recruiter products every month. That’s why we’re excited to share three new Recruiter and Recruiter Professional Services search enhancements that will help you hire the best person for the job, faster. In early tests, we’ve seen more than a 30% increase in profile views per search, a 10% increase in InMails sent per search, and a 5% relative increase in response rates, which underscores that these new search enhancements surface the most relevant prospects more quickly. Finding the right talent doesn’t start when you click “search.” It starts with establishing a deep understanding of the market and managing your hiring manager’s expectations from the get-go. That said, only a third of recruiters say they have tools that help them quickly size up talent pools1. Not anymore! This spring, we’ll introduce search insights. After you enter your search criteria, search insights will show you your talent pool’s current and past employers, years of experience, education, and location via intuitive, interactive, and sharable bar charts. These insights will help you quickly determine, for example, whether you should expand your search to new markets or adjust the compensation or title. Search insights will help you easily set better search strategies and educate hiring managers on market realities. Now that you’ve sized up the talent pool, it’s time to search. Our redesigned search interface, called personalized search, remembers your most-used filters and automatically surfaces them atop the new search drop-down. 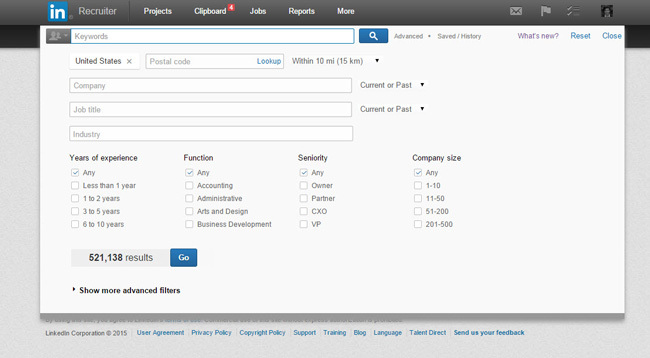 It also features a results counter that shows you how many profiles meet your search criteria as you adjust your search. The redesigned search results page makes it easier to take action on search results by quickly adding candidates to your projects or reaching out with an InMail. Personalized search will also be available this spring. Next up: time to review your search results. The new search relevance enhancements, which is available today, will continue to surface members who meet all your search criteria, but it now analyzes more of the info members put on their profiles. Here’s how it works: Let’s say you search for a “Product Manager” in “94101” (downtown San Francisco) for your company, Company ABC. 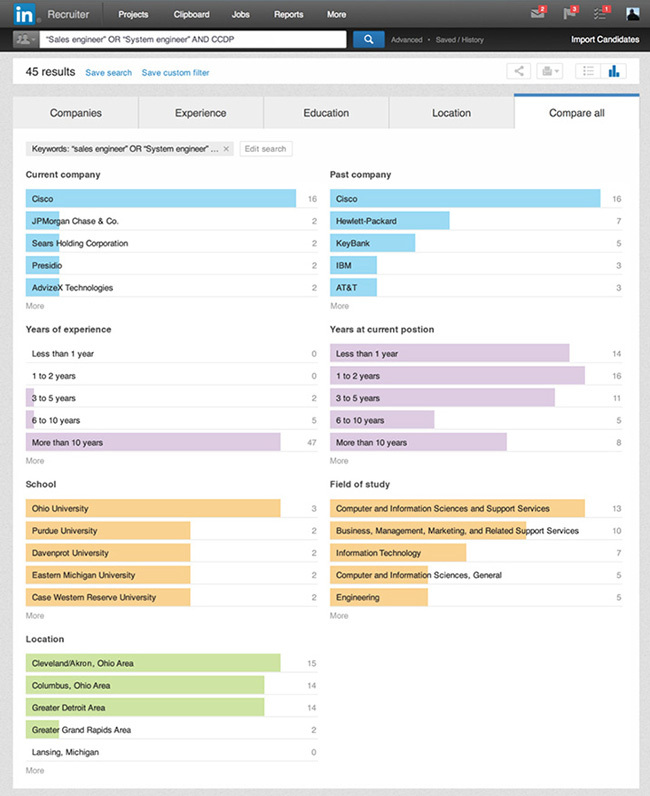 Search will identify all the LinkedIn members who meet 100% of your search criteria. Then it will prioritize your search results the same way it always has – based on how well each member fits your search criteria, using things like the prevalence of “Product Manager” on their profile and how close they are to downtown San Francisco. If search determines that the prioritization of your search results can be improved upon, it activates the new relevance enhancements. It places members higher in your search results if they’ve shown interest in your company or industry – either by following Company ABC’s Company Page, or a related company’s Company Page, or subscribing to relevant Pulse channels – or have skills, former employers, or education in common with product managers at your company or related companies. The relevance enhancements never exclude or remove members who would otherwise have appeared in your search results based on your search criteria; it merely re-orders them. A common question customers asked during tests was, “Will LinkedIn prioritize one search-ranking factor over another when I conduct my search?” No, we won’t. You will. That’s because we’re now using machine learning techniques that analyze everything you, and recruiters at related companies or in related industries, do on Recruiter or Recruiter Professional Services – from the profiles you view, to the InMails you send, to the members you interact with – and optimize your search results accordingly. But we’ll continue to weight your search criteria highest, so your search results will always meet all your search criteria. Our job isn’t done with the introduction of these new search enhancements. We’ll continue to test, iterate, and ultimately improve the relevancy of your search results. And that, combined with the upcoming search insights and personalized search launches, gets us excited about the impact we’ll have on a big part of your day – search. 1. According to LinkedIn survey of 448 recruiters in December 2014.